Limited time offer for Home Cleaning in Chicago -- 30% off your first booking! Hi My Name is Mariama but I go by Mj! I have been a professional cleaner in The Chicagoland for over 3 years. I have experience in both large and small homes as well as offices. Cleaning and housekeeping is a pleasure of mines so I always take care to do it with love! My favorite clients have me on a clean routine of bi weekly or monthly schedule ensuring everything stays with a Sparkle and Shine. Looking for a cleaner for your home, than look no further! I have 2 years experience & several years of cleaning my own home. I have a eye for accuracy. I’am very detailed oriented, trustworthy, punctual, & friendly. I’ll love to help you keep a clean & peaceful home! We're dedicated to keeping the apartments and homes of Chicago as clean as a whistle. Founded in 2012, the Handy platform is packed with top house cleaning professionals who offer unrivaled house cleaning services in Chicago. We're as personal as we are professional, and the full range of house cleaning and apartment cleaning services we facilitate is designed to make your life as comfortable as possible. Your professionals will take care of every house cleaning chore, freeing you up to devote yourself to the things that matter. So very thorough!! Great job on mirrors/windows. Bathroom looks excellent. All around, fantastic to come home to!! Thank you!! One of the best I've had thus far! And trust me, I've had a LOT of bad experiences with handy. I came home to a spotless house Yariela did an amazing job and I hope to work with her again in the future. Everything was great but the special request I put in (vents being cleaned) was not fulfilled. Otherwise it was welk done! Etta was very friendly, prompt and thorough. She went out of her way to ensure I was happy with work! Patricia was amazing! Thank you so much. My house was so clean! By far my best experience with Handy! Even let my puppy hank hang out with her while I was gone. Thanks again Patricia! I have been a Handy costumer for a long time, and Ebony is my new favorite! My place is so clean, she did everything perfectly! He asked many questions to ensure service was exactly what you wanted and needed. He was very thorough and easy to work with! Took care cleaning and did a great job. Carefully listens to client requests and is personable also, I'll request her again. Why use Handy home cleaning services in Chicago? Making a booking through the Handy platform is fast and efficient - if you have a surprise party coming up, or a valued client is unexpectedly coming to dinner, you want the place looking great at short notice, right? When you use the Handy house cleaning services platform, a top-rated cleaner can be there first thing in the morning. If you have a change of plans and need to reschedule, just let us know at least 24 hours before the start time and we’ll accommodate it with no penalty. We’re convenient – Use the Handy website or app to manage your bookings and schedule your housekeeping and home cleaning services with just a few taps. We’re affordable – If you thought cleaning services in Chicago were costly, think again. Professionals using the Handy platform are much cheaper than the alternatives. Your happiness is our goal. Every booking is backed by the Handy Happiness Guarantee. If you’re not happy, we’ll work to make it right. Booking home cleaning services through the Handy platform is straightforward, simple, and flexible enough to accomodate the most complicated schedules. Once you input your information, the Handy platform will connect you with a cleaning lady or cleaning man who will come with all the equipment needed for the job. Every cleaner has been vetted by Handy, so you won’t be opening your doors to a stranger, but rather a top-rated professional dedicated to providing you with top-quality service. 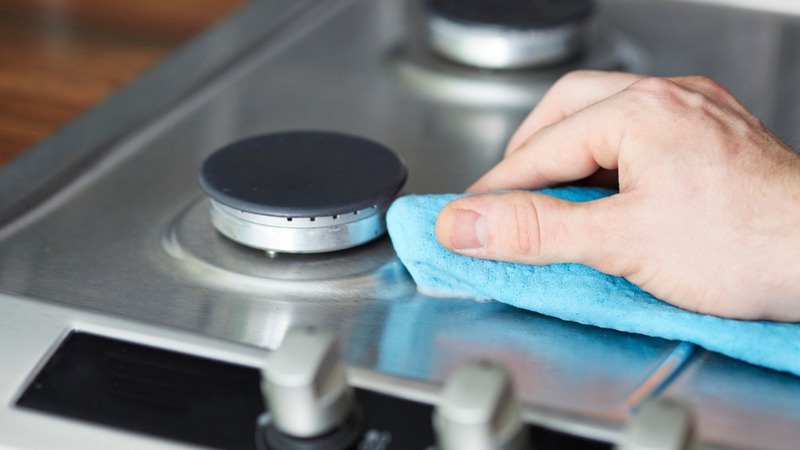 If you need a deeper clean or any other extras such as cleaning the inside of the fridge or cleaning your oven, just add it to the booking and it'll be taken care of. Your professional can also wipe down your windows and handle the laundry– extras are available to make sure you get the custom clean you want! Who can use Handy for home cleaning in Chicago? Handy is for everyone in the Chicago area. Top-rated professionals on the Handy platform have got you covered. Handy professionals are top-rated and the service they provide will exceed those provided by the best cleaning companies you may have used before. You may be a busy mom with kids and a job to juggle, or have a job that eats up far more than standard 9-5 hours. And if you’re vacating your apartment and want it to look its best when you go, our professionals can handle move out cleaning services, too. Professional cleaning services will get your home looking clean and sparkling in no time at all. Whether you’re living in a penthouse in Hyde Park, a loft apartment in Lakeview or a greystone condo in West Loop, search ‘best home cleaners Chicago,' and Handy will come up every time as the top cleaning service available. For Sarah Bernhardt, Chicago was ‘the pulse of America’, and we believe it is a description rightfully earned. With so much activity going on, it’s good to know that Handy is always there to facilitate your house cleaning and home cleaning needs. Whatever your needs, when you search for ‘Chicago cheap house cleaning' and download the Handy app, we’ll set you up with your next booking in just a few taps. While you’re doing your morning jog in Grant Park or waiting for the next train to your job in the Loop, it’s reassuring to know that your home is being cared for. From Little Italy to North Mayfair, Gold Coast to Fulton River, Handy has it covered. Are you a Bears fan eager to catch the game but saddled with a pile of laundry that needs to be taken care of in the house? Take your seat at Soldier Field and enjoy your Sunday while your professional gets the washer-dryer started -- you’ve earned it. Or if baseball is more your speed, head down to Wrigley and watch the Cubbies make Chicago proud. Maybe you walk past the Art Institute every day, but when was the last time you stepped inside? Of course, you’re familiar with the Sears Tower (calling it the Willis Tower will never feel natural, will it?) on the skyline, but did you ever think of going up to the viewing platform? The Shakespeare Theater at Navy Pier puts on some great shows, but when was the last time you enjoyed one? Book the best cleaning services in Chicago through the Handy platform and free up some time to be a tourist in your city. Experience the city’s unique buzz with fresh eyes while your top-rated professional handles the cleaning for you.